In general, you’ll find two types of outdoor spaces attached to urban homes: the tiny space that’s so cramped it’s nearly unusable, and the surprisingly large space that just begs for unique furniture. Both present unique design challenges that can be solved with the clever application of some unique outdoor furnitures. When you have a cramped urban backyard, every square foot of space counts. 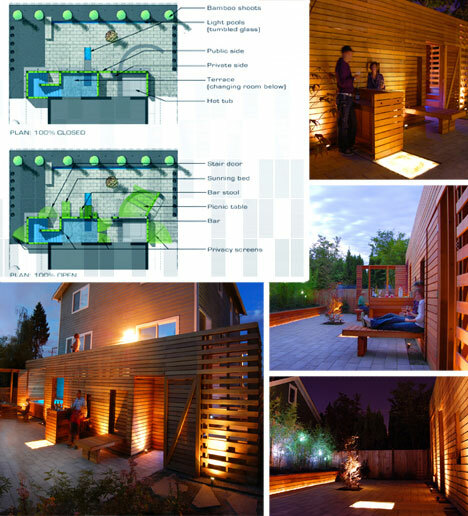 Architectural firm Pique was given the challenge of creating a patio setup that took up as little space as possible but still allowed for plenty of use. They came up with this innovative design that’s a little like a real-world pop-up book. An entire patio’s worth of furniture and living spaces is cleverly concealed in the vertical face, while the top acts as a terrace. Love sleeping under the stars but aren’t too keen on the idea of a tent? Spending the night in an outdoor bed gives you the best of the indoors and the outdoors with a comfy sleeping place that just happens to be poolside. As an added bonus, sleeping outdoors on a breezy summer night rather than cranking up your air conditioner can save a bundle on utility bills. You can’t go wrong with space-saving furniture, and that furniture scores bonus points when it doubles as something else. 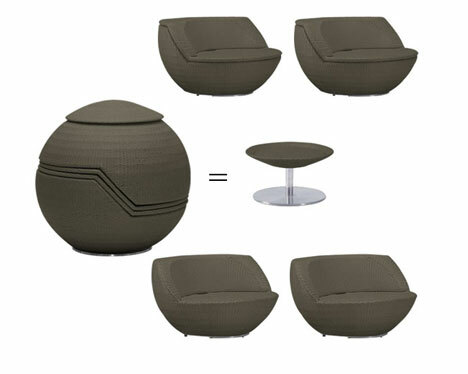 In this case, these four outdoor chairs and coffee table stack up to look like a golf ball sculpture when not in use. One of the most annoying things about outdoor furniture is its tendency to break down or become unusable if you leave it uncovered outside during inclement weather. 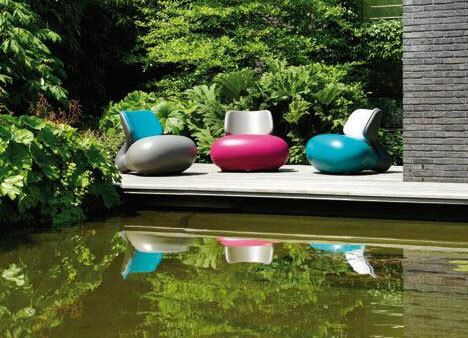 These Marlin chairs are designed to withstand being left outdoors, and they’ll look like giant pieces of candy on your patio. 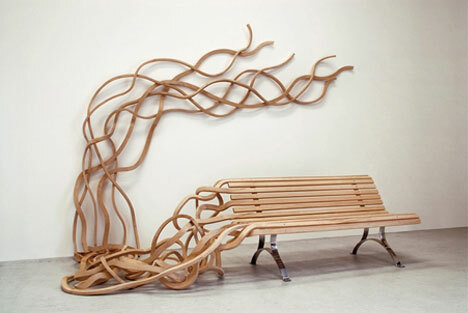 You wouldn’t want to leave it out to the mercy of the elements, but Pablo Reinoso’s Spaghetti Wall bench looks like a modern update to the bland wooden bench we’re so used to seeing in outdoor spaces. You can be pretty sure that you’ll have the coolest patio in the neighborhood with a bench that looks like it’s trying to crawl away. If you had a tree house when you were a kid, you know how great it was to have your own place to get away and be isolated for a while with just your imagination to keep you occupied. Not many urban homes have room for a tree house, but you can recapture that comfortable feeling of isolation with an outdoor fort. 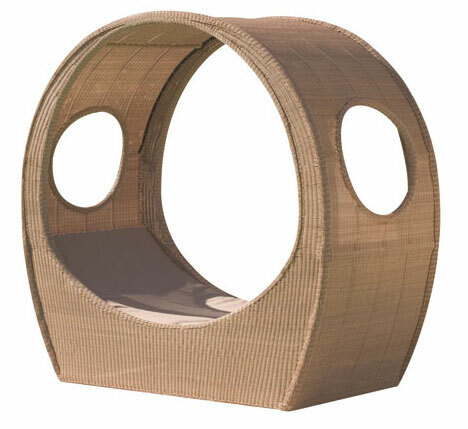 It’s more like a chair with a high back, but throw a blanket over the top and you’ll have the perfect hiding spot right in your back yard. These sophisticated-looking pieces don’t look like outdoor furniture, but in fact they’ve been coated with a special type of rubber that allows them to be used outdoors as well as in. 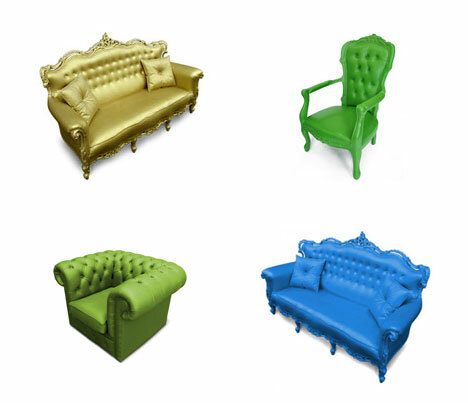 You can create a soft and cushy outdoor living room with these, complete with shiny gold couch. If you truly have no space on your deck or patio, having a place to sit down and relax can present a challenge. 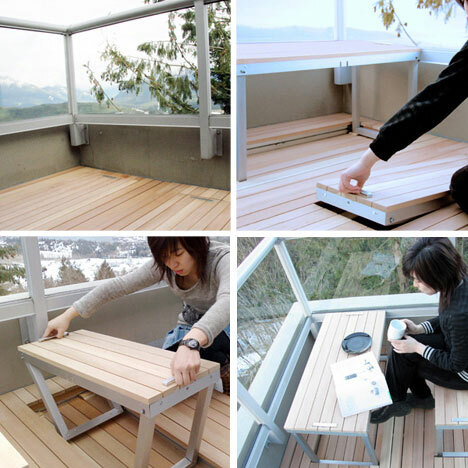 Designer Sandy Lam came up with a way to get around that problem: stowaway furniture that pulls right out of the deck itself. When not in use, it folds up to be totally hidden from view. 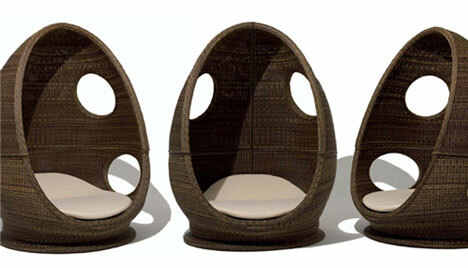 Outdoor furniture doesn’t have to be flimsy plastic lawn chairs, as these designs prove. No matter how much (or how little) outdoor space your home has, you can vastly improve the look and feel of the space with furniture that makes the most of the area it’s in.